In a very cold and loud Montana stadium this past Saturday, the University of Montana Grizzlies and the Wofford College Terriers played a football game. It was played among some of the most hospitable people in this country; they are loyal, fierce Montana Griz fans who love their team but who don't let their intensity in the stadium turn to animosity before or after the game. The game was one of the best played on Saturday with several lead changes and a heart breaking finish as a young man missed a field goal that would have won the game for his team. But in spite of the hard-fought game, and in spite of what we hear about athletes and college football, there was a lesson at the end of the game. Perhaps it is a lesson for all of us in our world today, as we make our own hurtful if not deadly rivalries out of words and blood. We deride others across the political aisle or on the other side of the world, but perhaps in this Holy Season for so many of us, we can learn a thing or two from two rivals that found time to kneel together at midfield after the game. 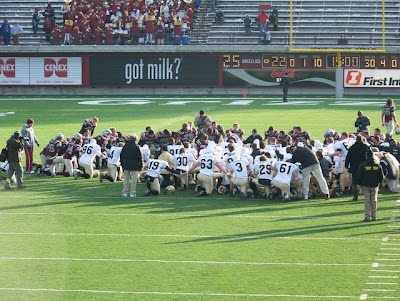 The picture above was taken following an euphoric victory for one team and a sudden season ending play for the other; Griz and Terrier team members form a circle and offer prayer together. This was a good game for many reasons. I'm the webmaster at Wofford and Wofford has a blogs page http://wofford.edu/blogs/. Would you mind if we linked to your blog on this page? I'd love to talk with you about this in more detail. If interested please contact me at jameskm@wofford.edu Thanks.